The Hallowich family on a hillside on their property in 2010. A just-released Washington County Common Pleas Court transcript of a 2011 settlement hearing in a Marcellus Shale damage case shows the case records should have included a confidential settlement agreement and reveals details of an unusual lifetime “gag order” that covers two children involved in the case. According to the 16-page transcript, then-Washington County Judge Paul Pozonsky approved sealing the court records with the settlement agreement “attached thereto” during a private hearing held to settle the claims of Chris and Stephanie Hallowich against Range Resources, Williams Gas/Laurel Mountain Midstream and Markwest Energy. 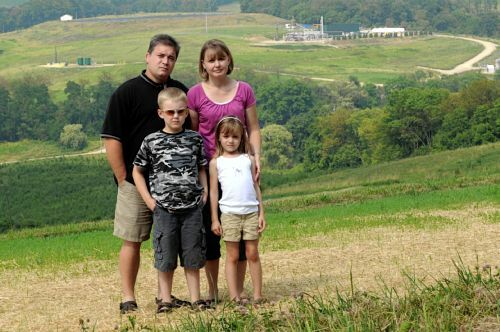 The Hallowiches, long-time critics of shale gas drilling, claimed that Marcellus Shale gas development — including four wells, gas compressor stations and a 3-acre wastewater impoundment — adjacent to their 10-acre farm in Mount Pleasant, Washington County, damaged the family’s health and the value of their property. The Hallowiches signed an affidavit as a condition of the settlement that stated their family’s health was not damaged by the gas operations. Matt Pitzarella, a Range Resources spokesman, said today that the family was not forced to sign the affidavit. “All of the reports done at the time indicated no exposure (from the gas development) and they never produced evidence of any health impacts,” Mr. Pitzarella said. The Pittsburgh Post-Gazette and the Washington Observer-Reporter successfully petitioned the court to unseal all of the Hallowich case records, but when more than 900 pages of records were released in March, the confidential settlement agreement was missing from the file. “This shows clearly the settlement agreement was part of the record,” said Frederick Frank, an attorney representing the Post-Gazette. The hearing transcript, which provides details of the $750,000 settlement paid to the family, shows the Hallowiches reluctantly agreed to the terms of the settlement to remove their children from what they considered an unhealthy environment. They also raised questions about how a lifetime “gag order,” as the judge called it, included in the settlement that required the entire family to never discuss Marcellus Shale or fracking would be enforced against their then 7-year-old daughter and 10-year-old son. According to the transcript, the Hallowiches’ attorney, Peter Villari, said that in 30 years of practicing law he never had seen a nondisclosure agreement that included minor children. And, although he advised the Hallowiches to accept the settlement, he questioned whether the children’s First Amendment rights could be restricted by such an agreement. Mr. Swetz could not be reached for comment. Although the settlement hearing, from which reporters from the Post-Gazette were barred, occurred in August 2011, almost two years ago, a transcript of the hearing was not produced until Mr. Frank requested it last month. Washington County Common Pleas President Judge Debbie O’Dell Seneca ordered release of the transcript, which was scheduled to be filed this morning with the Washington County prothonotary. The release of the transcript does not settle the case. Range and Markwest have appealed, to state Superior Court, the order unsealing the records. But Mr. Frank said, “We believe the transcript fully supports our position that the actual settlement agreement between the plaintiffs and defendants was part of the court record, and moreover it was reviewed by the court, which held extensive discussions regarding its terms. A 2011 study from the National Center for Atmospheric Research concluded that unless leaks can be kept below 2 percent, gas lacks any climate advantage over coal. And a studyreleased this May by Climate Central, a group of scientists and journalists studying climate change, concluded that the 50 percent climate advantage of natural gas over coal is unlikely to be achieved over the next three to four decades. Unfortunately, we don’t have that long to address climate change — the next two decades are crucial. To its credit, the president’s plan recognizes that “curbing emissions of methane is critical.” However, the release of unburned gas in the production process is not the only problem. Gas and oil wells that lose their structural integrity also leak methane and other contaminants outside their casings and into the atmosphere and water wells. Multipleindustry studies show that about 5 percent of all oil and gas wells leak immediately because of integrity issues, with increasing rates of leakage over time. With hundreds of thousands of new wells expected, this problem is neither negligible nor preventable with current technology. A version of this op-ed appeared in print on July 29, 2013, on page A17 of the New York edition with the headline: Gangplank To a Warm Future. Ray Ring received recognition in three national journalism contests for this story. He won the Sidney Hillman Foundation Award for magazine reporting, which is for journalism promoting social and economic justice. He was also a finalist for the Scripps Howard National Journalism Award and received an Honorable Mention Heywood Broun Award. “I was born and bred cowboy,” Bill says. The European Parliament’s Environment Committee took on board concerns from their constituents on July 11 by voting in favour of an amendment to the EIA Directive that would require a mandatory Environmental Impact Assessment to apply to all unconventional fossil fuels (UFF) projects, at both exploration and extraction phases. Some 51 MEPs lent their support to the amendment, with only 18 voting against. 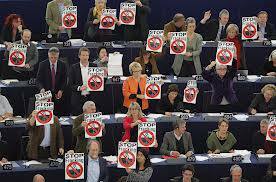 Conscious of efforts by some conservative MEPs to retract the amendment and to change its wording, the reaction from citizens who had lobbied their MEPs to support the amendment was one of jubilation and relief. The requirement for a mandatory EIA originally garnered broad political support in the own-initiative report on the Environmental impacts of shale gas and shale gas oil extraction activities adopted in Parliament in November of last year. The same report included an amendment calling on Member States to enact a moratorium on fracking but this failed to attract enough votes, with the Parliament’s largest political faction, the right-wing EPP group, largely dictating the result. The result was also welcomed by Czech MEP Pavel Poc (S&D), and by one of the report’s shadow rapporteurs French MEP Sandrine Bélier (Greens/EFA) who also referred to the “intense lobby pressure” preceding the vote. The current version of the Directive does not guarantee systematic and mandatory EIAs before new projects commence. Because UFF projects have a maximum daily production rate of between 115,000 and 250,000m3, they will never meet the 500,000m3/day threshold mentioned in the existing legislation. With regard to mandatory EIAs applying to the exploration phase this is an important addition because deep drilling and hydraulic fracturing techniques are used all along the process, including during exploration. Significant environmental damage can already occur during this phase, as was recently illustrated through new scientific evidence on the link between fracking and earthquakes. A mandatory EIA at exploration stage presents a significant hurdle for the industry. In Austria last year following plans by the government to make EIAs compulsory for shale gas projects, fracking company OMV decided to withdraw its plans citing economic concerns. The absence of a mandatory EIA is only one of several gaps in the EU legislative framework concerning both the exploration and extraction of UFF. These gaps were identified in a study published by the European Commission in September 2012. By the end of the year, the Commission plans to issue a risk management framework designed to give shale gas developers a positive signal. This framework is favoured by shale gas proponents such as Polish MEP Bogusław Sonik (EPP). Both industry and pro-shale MEPs have been opposed to such a comprehensive legal framework, while the most preferred policy option among participants in a European Commission public consultation is the development of a comprehensive and specific EU piece of legislation governing UFF. The results also indicated that two-thirds of participants believe that this industry should not be developed at all. During the last half of the twentieth century, the world’s irrigated area expanded from close to 250m acres (100m hectares) in 1950 to roughly 700m in 2000. This near tripling of world irrigation within 50 years was historically unique. But since then the growth in irrigation has come to a near standstill, expanding only 10% between 2000 and 2010. 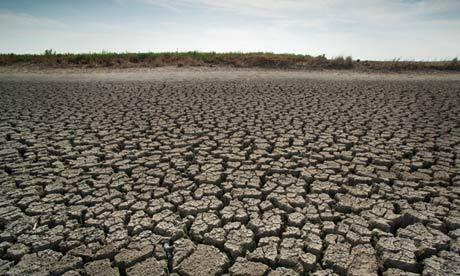 Today some 18 countries, containing half the world’s people, are overpumping their aquifers. Among these are the big three grain producers – China, India and the US – and several other populous countries, including Iran, Pakistan and Mexico. Observation wells near the twin cities of Islamabad and Rawalpindi showed a fall in the water table between 1982 and 2000 that ranged from three to six feet a year. In the Pakistani province of Balochistan, which borders Afghanistan, water tables around the capital, Quetta, are falling by 3.5 metres (11.5 feet) per year – pointing to the day when the city will run out of water. Sardar Riaz A Khan, former director of Pakistan’s Arid Zone Research Institute in Quetta, reports that six of Balochistan’s seven basins have exhausted their groundwater supplies, leaving their irrigated lands barren. In Mexico – home to a population of 122 million that is projected to reach 156 million by 2050 – the demand for water is outstripping supply. Mexico City’s water problems are well known. Rural areas are also suffering. In the agricultural state of Guanajuato, the water table is falling by six feet or more a year. In the north-western wheat-growing state of Sonora, farmers once pumped water from the Hermosillo aquifer at a depth of 40 feet. Today they pump from over 400 feet. Mexico may be near peak water use. Peak grain may be imminent. Falling water tables are already adversely affecting harvest prospects in China, which rivals the US as the world’s largest grain producer. A groundwater survey released in Beijing in 2001 indicated that the water table under the North China Plain, an area that produces half of the country’s wheat and a third of its corn, was falling fast. Overpumping has largely depleted the shallow aquifer, forcing well-drillers to turn to the region’s deep aquifer, which is not replenishable. Colorado, with a fast-growing population, has one of the world’s most active water markets. Cities and towns of all sizes are buying irrigation water rights from farmers and ranchers. In the Arkansas river basin, which occupies the southeastern quarter of the state, Colorado Springs and Aurora (a suburb of Denver) have already bought water rights to one third of the basin’s farmland. Aurora has purchased rights to water that was once used to irrigate 19,000 acres of cropland in the Arkansas valley. The US Geological Survey estimates that 400,000 acres of farmland dried up statewide between 2000 and 2005.